Happy Monday you guys, and Happy Halloween! Anyway, my sweater is from Target and for some reason I cannot find it online, sadly, but I have linked some other cowl neck sweaters that I really like above and in the widget below! I am sure if you head over to your local Target you will find this sweater! They had them last year, and I bought it in grey (see blog post here), and I loved it so much, I bought this red one! I love the color of it, its so cozy and fall-ish! Everyone needs a good cowl neck sweater in their closet! It is timeless and always looks classy. 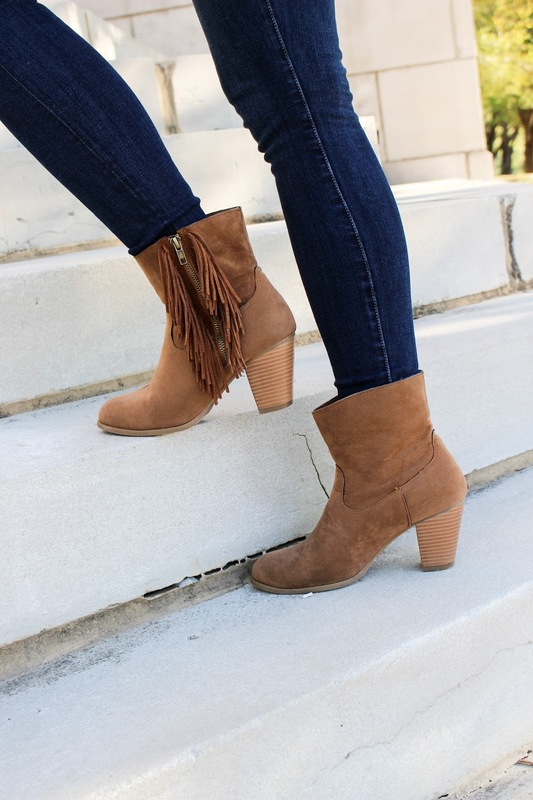 Also, I wanted to point out that my fringe booties are on sale for under $37! I bought them last year and think they are a great addition to your bootie collection! The fringe is so fun and is a major trend this fall!